Fiction – paperback; Virago Modern Classics; 160 pages; 1992. Until very recently I had Nina Bawden pegged as a children’s author. Then, while browsing BookMooch a week or so ago, I accidentally discovered she had a rather extensive back catalogue of adult fiction that I simply did not know about. I promptly acquired a rather battered copy of A Woman of My Age (Virago Modern Classic Number 366) and set about reading it. 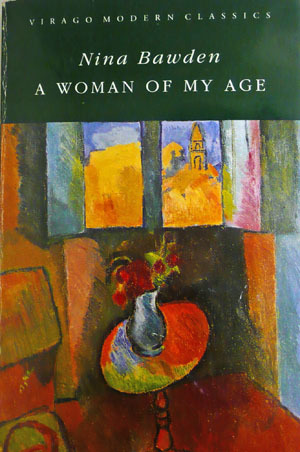 First published in 1967, this short novel reminded me very much of Doris Lessing’s The Summer Before the Dark in that it tells the story of one woman’s emotional journey — figuratively and physically — as she struggles to come to terms with growing older and finding her rightful place in the world. I find this so difficult. When I look in the mirror — not to see if the grey roots are beginning to show before the next tinting, but in the same way I used to look at myself when I was seventeen, at what, whom and why — I remain, as I did then, cloudy, fading, sadly out of focus. I do not know myself, only my situation: I am Elizabeth Jourdelay, married to Richard, the mother of his two sons. I am, I am middle-aged. This is an embarrassment that has come upon me suddenly, taking me by surprise so that I don’t really believe it. Looking in the mirror I see the wrinkles, but perhaps tomorrow they will be gone and my skin will be smooth again. Though wrinkles are not important. The important thing is that I am in the middle of my life and I feel as I did when I was adolescent, that I do not know where to go from here. Now, on holiday in Morocco with Richard, Elizabeth longs for the desert because her life was “crowded, cluttered up”. But the journey is far from the calm, peaceful one for which she longs. Alongside the heat, there are other English travellers with whom she must contend: the delightfully eccentric and elderly Mr and Mrs Hobbs, and the slightly vain, thrice-married Flora and her much younger lover, Adam. While Elizabeth enjoys the Hobbs’ company, because they remind her of the parents she never had, she finds Flora irritating. Indeed, Flora had gone to Oxford with Richard, and there are suggestions that they pair may have been lovers in the distant past and that their accidental meeting in Fez may have been pre-arranged. These niggling suspicions eat away at Elizabeth, who finds herself analysing her own marriage with a man she barely knew when she married him, aged 20, some 18 years ago. A Woman of My Age is definitely a product of its times, when women married young and were expected to stay at home and raise a family. But in Elizabeth Jourdelay, Bawden has created a headstrong and independent character who rails against society’s “rules” and constraints. Raised by two spinster aunts, one of whom brought her up “to give too much importance to careers and causes and things of the mind”, Elizabeth finds marriage and motherhood constricting. A highly political creature — “I was very unsure of myself except in matters of political opinion” — she longs to become a local councillor but Richard thought it a “dirty game and he could not understand how I could endure it” . Unfortunately, it does not pan out as planned. clear that nothing which came up to my expectations was open to me. There’s something very sad about Elizabeth reconciling her expectations with keeping her family happy, because it’s clear that her husband has not had to do the same thing. Of course, we only hear Elizabeth’s side of the story, but as the narrative progresses you begin to understand that Richard is not the saintly school teacher husband he purports to be. And while Bawden deftly captures all the tensions and betrayals and compromises that married people make, she also does a nice line in setting the mood. Her descriptions of Morocco are particularly vivid. The terrace of the casbah fell away down the hill, dovetailed into one another like the streets and courts of a medieval city, all enclosed in a wall of the same red earth. At one end there was a little tower where cranes were nesting. Beyond the wall was the palm-grove, a chess-board of different coloured grasses, and beyond the oasis, the flat, ochre colour of the desert. The air quivered, not just far in a heat haze, but close by me on the parapet, in a kind of vibrating brightness that hurt my eyes. In fact, setting the book in Morocco is a clever touch, because it allows Elizabeth to compare the subjugation of women in North African societies with her own situation. Indeed, when Flora points out that “their men shut them up at home; even if you visit the house, the women don’t appear socially. Just to serve the food” the point seemingly goes over Elizabeth’s head, but it did not go over mine. Having read my first Nina Bawden adult novel I’m keen to read the others — there’s certainly plenty to keep me occupied as you can see by this and this. Next on the rank is The Birds in the Trees or maybe I will try Afternoon of a Good Women, two books I mooched even before I’d come to the end of this one. If they are half as good as A Woman of My Age I am sure to be in for a treat. This sounds really good. I have not read anything by this author. It does reveal the time when this was written when 38 was considered middle age! I know I’m late in commenting but one of her late ones ‘Circles of deceit’ was brilliant. I also enjoyed ‘Afternoon of a good woman’. Never too late to comment, Annabel. I’ve got a few Bawdens in my reading queue, including Afternoon of a Good Woman, but don’t have Circles of Deceit. Must check it out.